Meet the first affordable, 100% toxin-free, plant-based multi-tasker bath & hair product made just for kids. 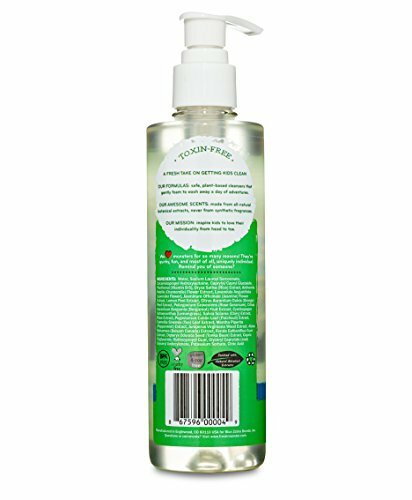 Fresh Monster Kids Shampoo & Body Wash foams and cleans like mainstream brand products, is as safe and natural as premium brands, but without the sticker shock. And for kids who cannot wait to get right back to playtime, we’ve combined shampoo and body wash into one simple step for a head-to-toe clean. Fresh Monster Kids Shampoo & Body Wash has no toxins, sulfates, parabens, phthalates, dyes, synthetic fragrances, BPA, gluten or soy. Formula is Dermatologist-Tested to be safe for even sensitive skin. Made in the USA with no animal testing involved and certified Cruelty-Free by PETA. Meets the highest standards for personal care products set by Whole Foods and the Environmental Working Group, which is no easy feat! 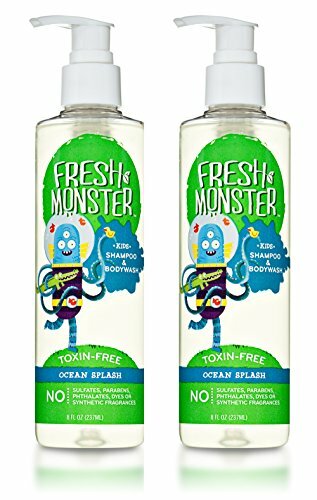 Made with all-natural botanical and fruit extracts, Fresh Monster Kids Shampoo & Body Wash, Ocean Splash uses all-natural fragrance ingredients that are clearly labeled on the bottle. And as one of the very few brands of bath & hair products using natural botanical extracts instead of chemical fragrances, we promise to always be totally transparent about our ingredients instead of hiding behind the word of fragrance.O This kid-centric shampoo body wash 2-in-1 comes with a goof-proof, re-closeable pump that lets kids take charge and makes travel a breeze. Plus, the bottle is home to an irresistible and quirky monster to delight and inspire kids to embrace their uniqueness. Building strong, independent kids requires nurturing their insides as much as their outsides. Fresh Monster is founded by two moms on a mission to bring safe, affordable hair products to all families and to encourage children to embrace their individuality from head to toe. Our quirky, fresh monsters radiate confidence and celebrate what makes kids unique.Contains 2 – 8 ounce bottles of SHAMPOO BODY WASH 2-IN-1 FOR KIDS – Meet the first affordable, 100% toxin-free, plant-based multi-tasker bath & hair product made just for kids that cleans head to toe. TOXIN-FREE – Fresh Monster Kids Shampoo & Body Wash has no toxins, sulfates, parabens, phthalates, dyes, synthetic fragrances, BPA, gluten or soy. Made in the USA with no animal testing involved and certified Cruelty-Free by PETA. WITH NATURAL FRUIT AND BOTANICAL EXTRACTS – Scented with all natural, botanical and fruit extracts that are clearly labeled on the bottle, not hiding behind the word “fragrance.” Say no to toxins and yes to transparency! KID-CENTRIC – comes with a goof-proof, re-closeable pump that lets kids take charge and makes travel a breeze. Plus, the bottle is home to an irresistible and quirky monster to delight and inspire kids to embrace their uniqueness.